I never thought I would have visited Amsterdam as soon as I did last May. Now, after spending a weekend there I would love to go back and see the things I didn’t have time to do, and also explore more of the Netherlands. Today, I’m sharing with you a few of my favorite things from the trip. Cloudy and a little rainy during our weekend away, but still a delightful trip! 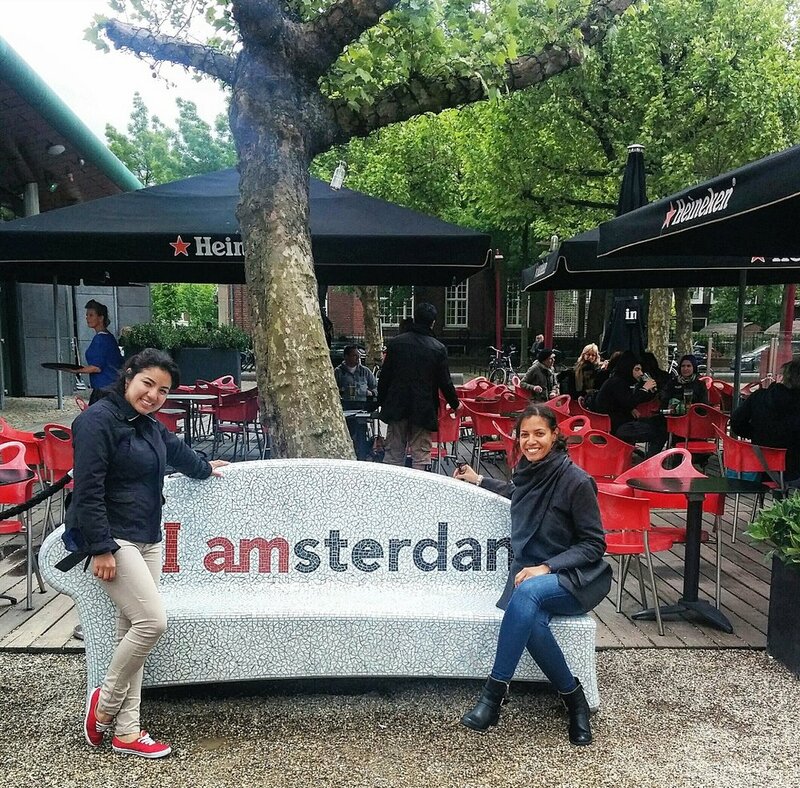 The initial idea of going to Amsterdam was brought up by my good friends, Marcela and Kurtis. Last year, they took their first Eurotrip together, spending 2 weeks country hopping from Paris to Spain to Germany, with Amsterdam in between. My love and I met them in Paris where we spent our first part of the trip walking around, showing them all the major sites The City of Lights has to offer, then took a quick flight venturing north to the Netherlands. This was the first time for all of us to explore this part of Europe, and it was Marcela’s first time in Europe. 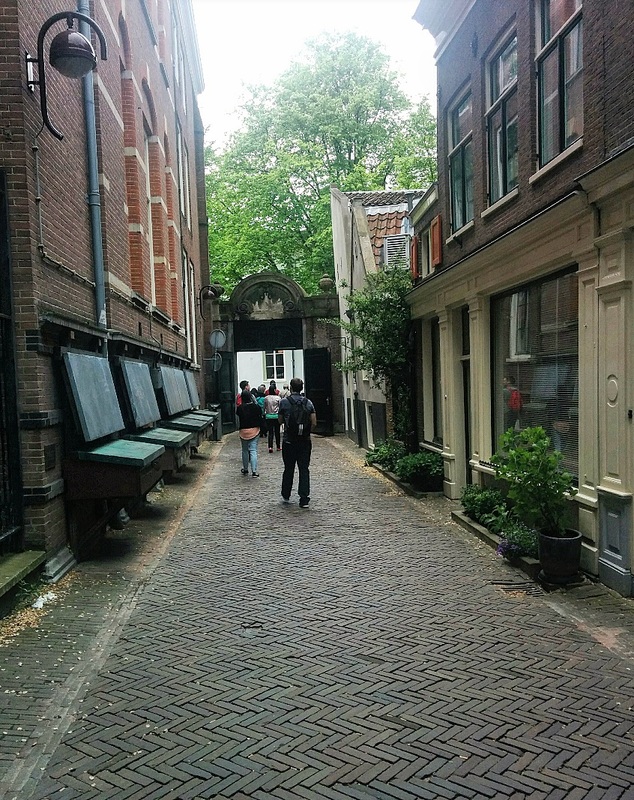 I had researched a few things to see and do beforehand because my stereotypical images of smoking marijuana and the Red Light District were hard for me to believe were the only true highlights of the city. Thankfully my initial ideas were wrong. We arrived in the early morning at the Amsterdam Airport Schiphol, bought bus tickets from the information desk and went outside, in the rain, to wait for the bus to take us to the city center. The airport itself is connected to a good-sized modern shopping mall filled with international and local brands and different types of restaurants, perfect for window shopping and to pass the time away if you arrive early for your flight. The view just as you exit the airport. The bus station is to the right of this welcoming sign. I thought only one of these signs existed, but there are actually two city icons. If you want good photos of the “I amsterdam” sign, I suggest taking them at the airport because the more popular sign most definitely will be crowded with people in the Museumplein area. Photobomb: Be like this guy leaning on the “I” and chillax in your new surroundings. One good thing about the Netherlands is that everyone speaks English. The country is home to over a hundred different nationalities and backgrounds, so it makes sense that English is widely used. I was super impressed by everyone’s language skills and it made our stay here much easier knowing a common language with the locals. On the bus, however, I got a different impression. The automated announcements giving each next stop were in Dutch, including what showed on the TV monitors inside the bus, all written in Dutch. Being the language lover that I am, I listened carefully to the voice over the speaker to see if I could find some kind of relation or similarity with any other language I’ve heard or have been exposed to before – I couldn’t. The language was very strange to my ears in the beginning moments but after a few stops I got a grasp of the equivalent to “stop”which was something similar to “halt”. Street view of the buildings, bikes and more bikes. We’d booked an apartment to share via AirBnB, but it was too early to check in, so after we got off at our bus stop, we decided to get something to eat, and particularly at a place with a WIFI connection so we could communicate with our host via Whatsapp. As I had previously read on multiple sources while doing my research on Amsterdam, the Netherlands in general is not well-known for its food, so instead of eating out and exploring the restaurants, we went shopping at a grocery store and cooked for ourselves – another reason for doing this was to save money and budget since the month of May was filled with lots of trips. You can learn a lot about a country’s culture through its food. We settled on eating at a diner-type restaurant featuring a popular Dutch food: pancakes. My love ordered a Hawaiian style pancake with pineapple, peppers, ham and cheese, which looks in between a US pancake and a French crepe, only much bigger. And you can have it with either savory or sweet toppings. I had a bit and it tasted just as I described, so not a bad combination at all. I opted for an English breakfast dish that always reminds me of my home and family in the UK – comfort food. My friends had ordered and shared a bowl of soup and a sandwich. A Dutch pancake – Yes, it was enormous! I love people-watching, especially in new surroundings, and I noticed a mix of locals and out-of-towners, so the place wasn’t a bad choice to start off our stay. We stuck around at the restaurant going over my suggestions for sightseeing, until it was a good time to go check-in at the apartment. While looking for the perfect AirBnB and location, we had initially tried to stay on a houseboat (how cool would that be?! ), but the two we had found were already booked. I really want to try and make this option happen out the next time we take another trip here. How cool would it be to live or even just stay a weekend on a houseboat?! We'll be doing this next time! After checking in, we went on a walk around the city center and major plazas to explore and see what was around. Our first stop was Museumplein, shown in the photo below with the famous Rijksmuseum peaking out in the background. The Van Gogh Museum is also located here, with the largest collection of the artist’s work. Book your entrance tickets in advance for all museums in order for guaranteed entrance. As I mentioned earlier, the “I amsterdam” signs are located in two places. The first being at the airport and the second is pictured here at Museumplein. Perfect place for people-wathcing. If you want to avoid the crowds, I would opt for the sign at the airport. We did wait our turn to get a few snaps in, and then made our way to walk around the exteriors of the museums and take in the architecture. We found a third “I amsterdam” on a bench as we were walking away from Museumplein! One thing I haven’t brought up yet is important to take note of before you get injured – or just embarrassed like I did. 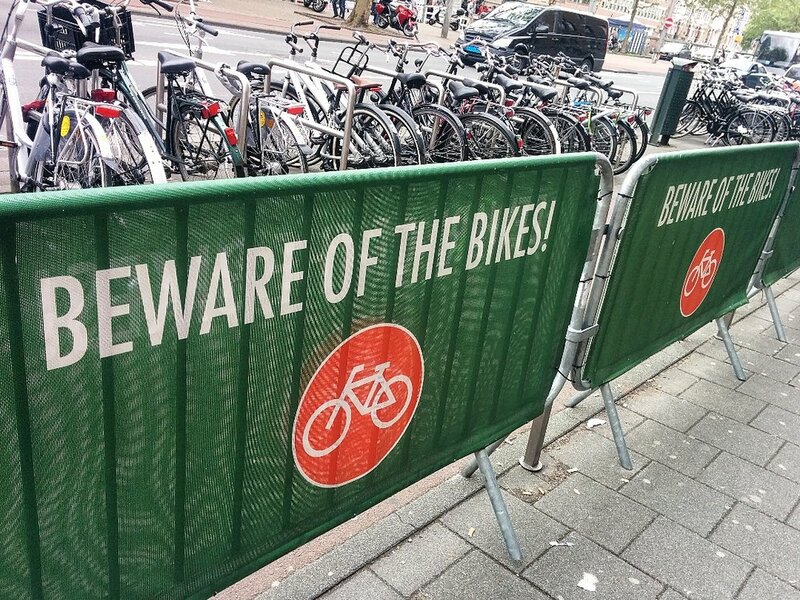 The Dutch are very avid bike-riders and take it just as seriously, if not more, as driving. Amsterdam is a pretty green city and more people use bikes than cars. There is a special culture with riding a bike and you will learn quickly that you cannot accidentally walk along the bike lane – I learned the hard way, no injury involved. A bike and scooter parking lot. You can find these types of lots all around the city. There is even a bike parking garage close to the train station and port – great innovative ideas for a cleaner and safer environment. Other cities should use this as an example. After our Museumplein exploration, we walked around the area by our apartment. 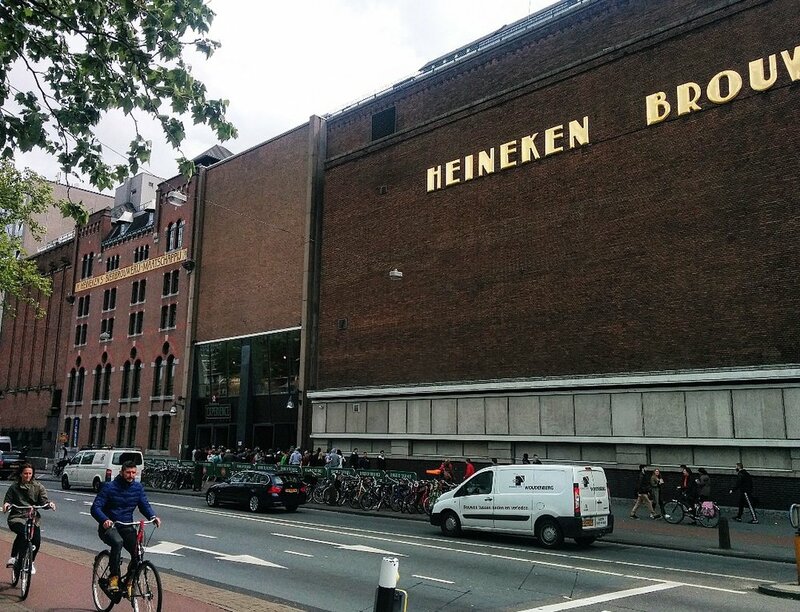 We stumbled upon the Heineken Brewery, called the Heineken Experience. The red brick building is massive, providing daily tours of the brewery with tastings included at the end. You can also make reservations for special events that includes a boat tour along the canals. I would definitely like to take a tour the next time I’m back. These types of signs should be placed throughout the city for tourists to be aware…or just for me to stop walking on the red bike lanes. After looking at a map, we thought the Heinekin Experience building was further out of the city, but it was literally around the corner from our apartment and near the grocery store we stopped at to buy food for the weekend. The one thing I can distinctly remember about the grocery store is that there was a large walk-in refrigerator filled with all diary products from milk to yogurt and cheese. I don’t think I’ve ever seen one of those before and specifically for customers. The meeting spot for our tour group, in front of what use to be the gate of the city. 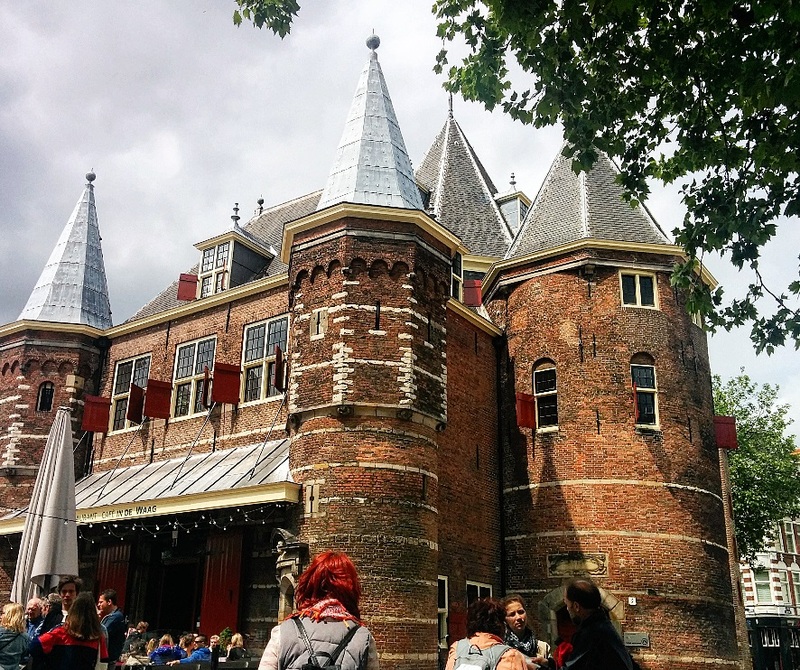 The castle-looking structure is now a restaurant and cafe called De Waag. During our second day, we started off with a guided walking tour. These are the best kind of tours because it’s by donation only and given by a local, taking us to places we might miss, including where exactly the hidden church is inside the Begijnhof courtyard, which building is claimed to be the oldest and one of the smallest in the city, and a little history on the Red Light District. It was an excellent tour, and below you will find some highlights from the tour. Before Napoleon III changed the rules about having last names, the Dutch used to have these crests or emblems in front of their homes to distinguish one family from another, usually by what trade they worked in. Beautiful architecture with hidden gems, like the painting at the top of this building. I was so happy the sun made an appearance during our tour and the rest of the day! Our tour group of about 20 people from all over the world. We were either entering or leaving the area where a book market is located. Outside a hidden church located in a small residential courtyard that used to house nuns. Today the tradition continues and only single, unmarried women can live in this cute area. This photo is more than just of a cafe. It’s written in French to say “Prostitute Quarter” since it’s located in the Red Light District. To the left of it is an alleyway of windows and doors in the “Big Mamma’s Alley” portion of the district, as well as a Kindergarten and the Old Church just across. Super eclectic and open-minded city. 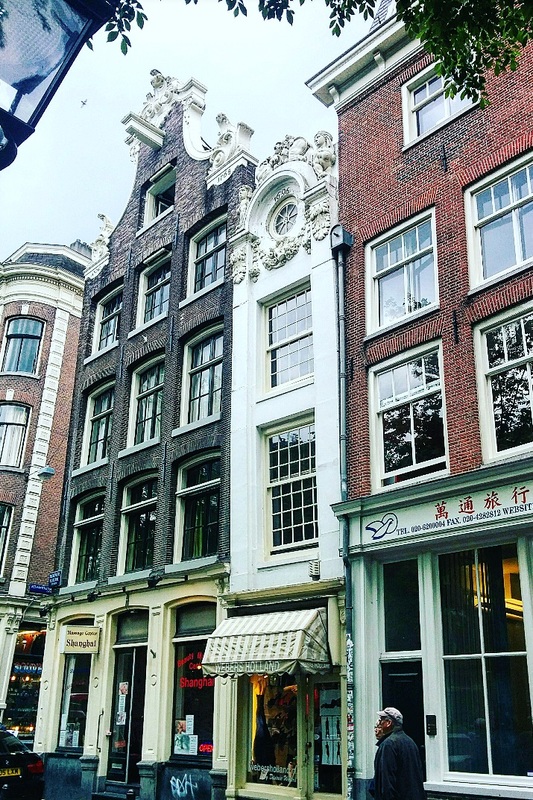 One of the smallest and narrowest, and most likely the oldest building in all of Amsterdam. After the tour I asked our friendly guide where is a good place to eat. She suggested going to the Chinatown area and stop at a Thai restaurant – the best decision ever! We sat at the window with perfect views for people-watching outside, and those coming in and out to sit at a table or take-out – or even just take your food and eat it on small benches outside! Either way, this restaurant was the perfect decision! Following our amazing lunch, we toured around the Prinsengracht area, stopping to have a look at the Anne Frank house. It was a somber moment for me and I didn’t want to stay long. I read her diary in middle school, saw the play and movie, and now to actually stand in front of the house was a little too much. I couldn’t have gone inside. Anne Frank Memorial Statue. So so sad to know she was just a young girl and died 2 months before the war ended. If only she hung on, would we still know her story today? The last thing we did was explore the port of Amsterdam and took a free ferry across to a little island to have a quick look. We also walked around the central station for trains and the tram. It was a nice end to our day and stay. Dusk settles in an the nightlife begins on our last night in Amsterdam – photo is a little blurry but still shows a good capture of how the ambiance changes from day to night, and just how eclectic the city actually is and is probably my favorite aspect of the city. 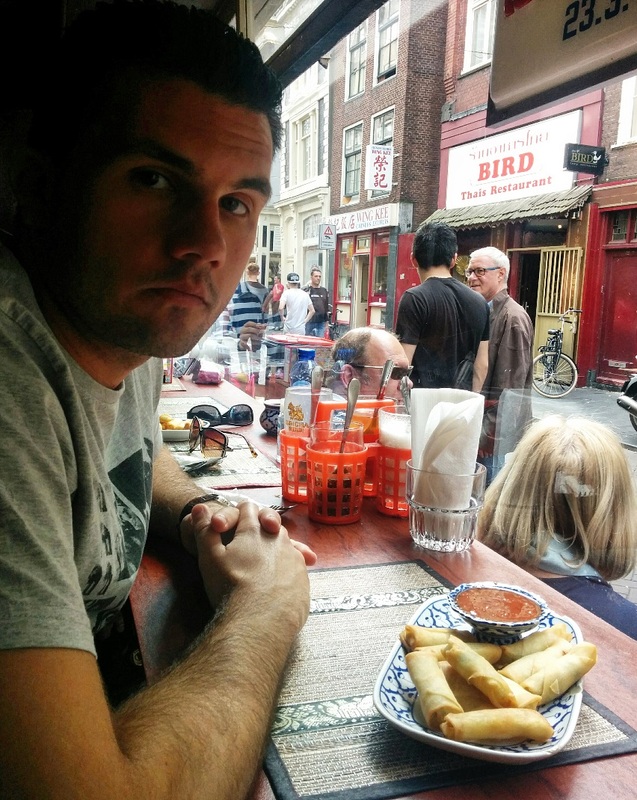 Overall, our Amsterdam trip was fun. I learned a lot about the city’s history and how it has transformed throughout the centuries. I have this destination on my return list and I would love to explore the windmills and tulip fields! Are you ready for your trip to Amsterdam? https://www.rijksmuseum.nl/en – official site of the Rijksmuseum to pre-book tickets and see what special programs and exhibitions are going on. http://cityfreetour.com/amsterdam/ – book a free city tour around Amsterdam, from a general city tour to more specifically around one particular area. Highly recommended! Book in advance! Disclaimer: ALL pictures are taken by myself and are not to be reproduced without my knowledge and permission. I never take it for granted whenever I get the chance to go to Paris for a long weekend. A certain feeling of happiness like I’m a little kid always comes into my mind when I know my next trip to Paris is coming up. No visit is ever the same and I always discover something new every time. Thankfully with each trip my sense of direction and navigation around certain places, especially the metro, is gradually improving. In this post, I’ll be sharing with you all of my combined favorite memories and moments from my long weekends away in the one and only…(cue French accent) Paris! My first full-view of the Eiffel Tower entering from Trocadero, during my second trip to Paris. My recommendation to start your walking tour is by passing through Trocadero’s grand plaza and admiring the architecture of the Palais de Chaillot before coming to the top of a double staircase and take in this same exact gorgeous view. After taking all the photos at your heart’s desire, you have a choice of taking the stairs on the left or the right, and decide if you’d like to take a walk by the beautiful fountain featured in the photo above or through the gardens, which you can find on the right of the fountain. I’m attracted to water so I’ve always opted for the fountain, but the next time I go in March I will finally go through the gardens. I had a lot of fun taking this picture with my good friend Marcela last May. She and her fiance came to visit during their Eurotrip and we ventured to Amsterdam after our stay in Paris. No matter rain or shine, with an umbrella in tow touring any city can still be fun! The best way to see Paris is by foot. I feel that if you are constantly taking buses, the metro or taxis to get around a city, you are potentially missing some great things, such as the beautiful architecture, window shopping and people watching. By observing your surroundings you can take in a sense of everyday life, people’s behavior and mannerisms, etc. which can help you to understand more about the culture. The next time you find a park bench, have a seat and absorb what you see around you for even just a couple minutes. I bet you will be pleasantly surprised with what you see. After walking around Trocadero and up towards the Eiffel Tower, head up closer to walk directly under the tower or get a side view from Champs de Mars, as this photo shows, of this magnifique monument. I don’t know what it is about the Eiffel Tower, but every time I visit Paris I cannot leave without getting a little glimpse of it, up close or in the distance, it doesn’t matter to me. I can remember the first time I saw the Eiffel Tower very clearly: it was my second time in Paris (the first time being when I first arrived to France but had no time to visit the city) when my love had planned it all out to have me see my first take of the Eiffel Tower via the metro. I was as awe-struck as you think and everything I had imagined when seeing the top portion of the structure beaming up into the sky, peering out from the tops of apartment buildings and businesses that hide the bottom half. You’ll be able to watch the elevator cars ascend and return from the top, always full of passengers from dawn to dusk. I’ve never actually gone up the Eiffel Tower before but I might get the chance in March. I found some good package deals on http://www.getyourguide.com for exclusive guided tours and options for different experiences, including a river cruise tour and entrance to the Louvre. Not a bad deal at all! There are many options for every budget. Another favorite memory was celebrating my 30th birthday in Paris last November. It was probably my favorite birthday celebration yet, as it involved my first boat tour along the Seine, lunch and live music included, making eye contact with French actor Omar Sy at an exclusive art exhibit, and ending the festivities with the Red Hot Chili Peppers. This photo pretty much sums up my 30th birthday weekend: boat tour on the Seine, beautiful weather, and of course, celebrating with a glass of wine. Did you know there is a replica of the Statue of Liberty in Paris? I knew there was a model located somewhere in Paris, but I had no idea it’s placed right along the Seine! Lady Liberty sure looks nice with the Eiffel Tower as her backdrop. When my sister came to visit last summer we had a guided midnight tour by my love’s brother who lives in Paris and is a pro at giving special tours and showing places that are typically not on the tourists must-see list. It was my sister’s first visit to France and she loved seeing the different vibes of Paris during the day and seeing how it transforms at night. It was a perfect summer evening, going across bridges and getting a view of the Seine river with boats passing by and the Eiffel Tower lit up and beaming in the distance. 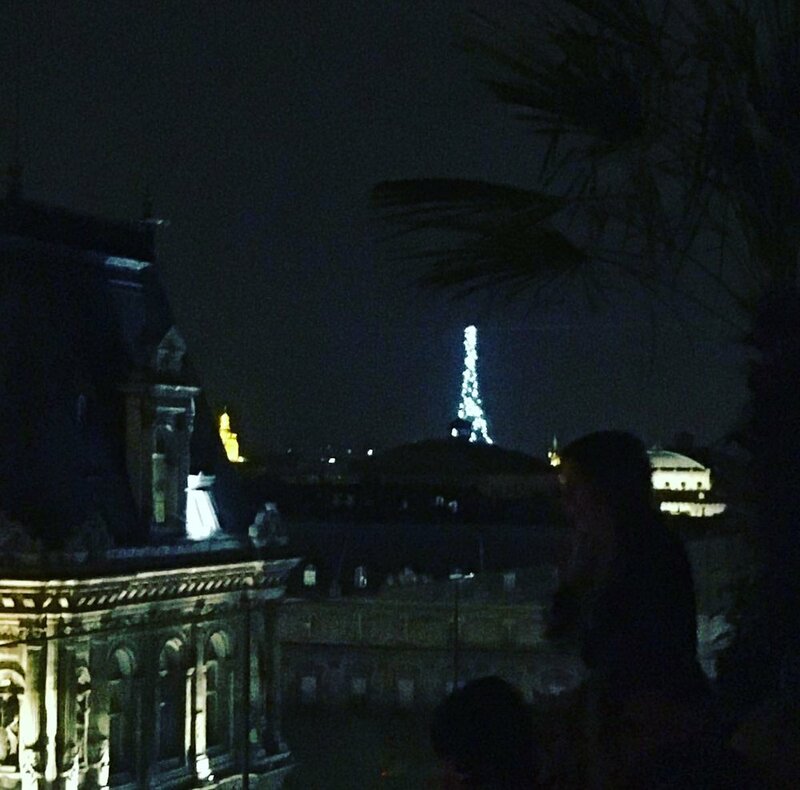 We ended the tour with a drink at a rooftop bar called Le Perchoir Marais and we were in a spot to see the Eiffel Tower glimmer in the distance with its glittering lights for the last time of the evening and it was magical. Walks across the many diverse bridges over the Seine, staring at the shimmering water and boat passing by in the City of Lights at night. I don’t know about you, but in my eyes a city has two faces and styles – a daytime look and a night on the town – just like an outfit. A different view of Paris at night, this beautiful building houses a hotel and rooftop bar. I 100% approve and a visit needs to be had especially on a warm summer night like I experienced it. At the top you have views of the sophisticated town hall and mayor’s office, as well as the Eiffel Tower full of glitz and glamour at the top of every evening hour until 1am. The entrance to the Grand Palais. Be sure to order tickets directly from its website to choose your entry time and have peace of mind that you will be able to enter. However, even with a ticket, be prepared to wait at least 20 minutes in line before everyone with the same scheduled entry time can go inside. I’ve been told that there’s always a line here so booking ahead is highly encouraged. My last trip to Paris was to celebrate my love’s brother’s 25th birthday. Before his big birthday bash I managed to go see an exhibition at the Grand Palais featuring the pioneers of Mexican art, including Frida Kahlo and Diego Rivera – two of my all-time favorite artists. I couldn’t wait to feast my eyes on some of their pieces and wasn’t at all disappointed. It took a good 2 hours to complete the entire exhibit including listening to the audio guide. I probably stood close to 5 minutes at a few works, principally because I couldn’t believe my eyes that I was actually staring at a work completed by artists I have been admiring since I first discovered them in middle school. What an amazing sensation! I hope you enjoyed reading about my favorite moments in the most romantic city in the world! I’d love to hear from you. Have you been to or dream of going to Paris? What was your favorite thing to do or see? View from the rooftop bar Le Perchoir Marais. On the left is the town hall and in the distance the Eiffel Tower giving one last glimmering show for the evening. 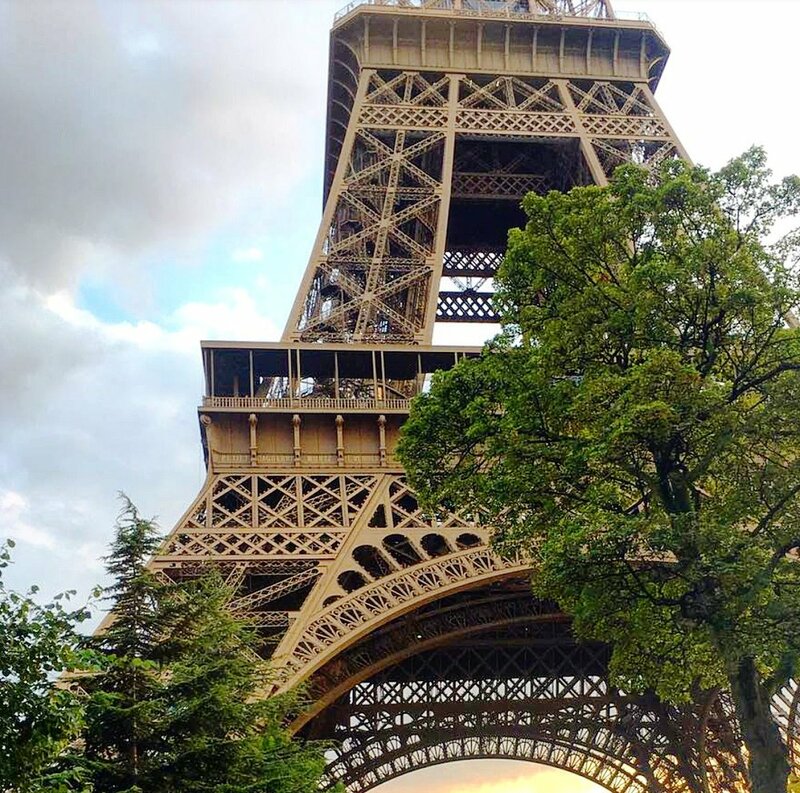 The best views of the Eiffer Tower – Where to go around Paris to get an amazing view of the Eiffel Tower and other famous landmarks and monuments. 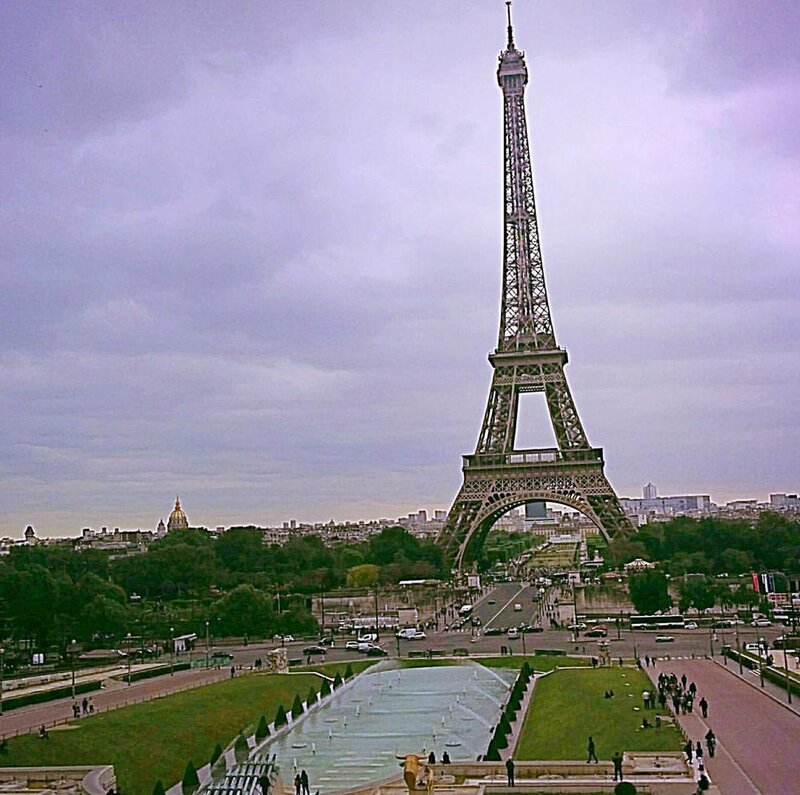 Get Your Guide – Find tours and tickets for the Eiffel Tower and more. Two words to describe Venice, Italy: Absolutely Magical! From the impressive architecture and winding cobblestone streets to the mystery and wonder of being transported by boat along the blue lagoon. The trip to Venice was a surprise present from my love last year and I wasn’t disappointed when we arrived and started our romantic long weekend away. We went during Valentine’s weekend, one week after Venetians had celebrated their traditional Carnival, and we had a small glimpse of what was left of the festivities. Not only was this a trip to celebrate Saint Valentine, but also to celebrate our “half anniversary” together (of 1 1/2 years), which happens to be on February 13th. Today marks our 2 1/2 years together – we’re romantics and we know it. 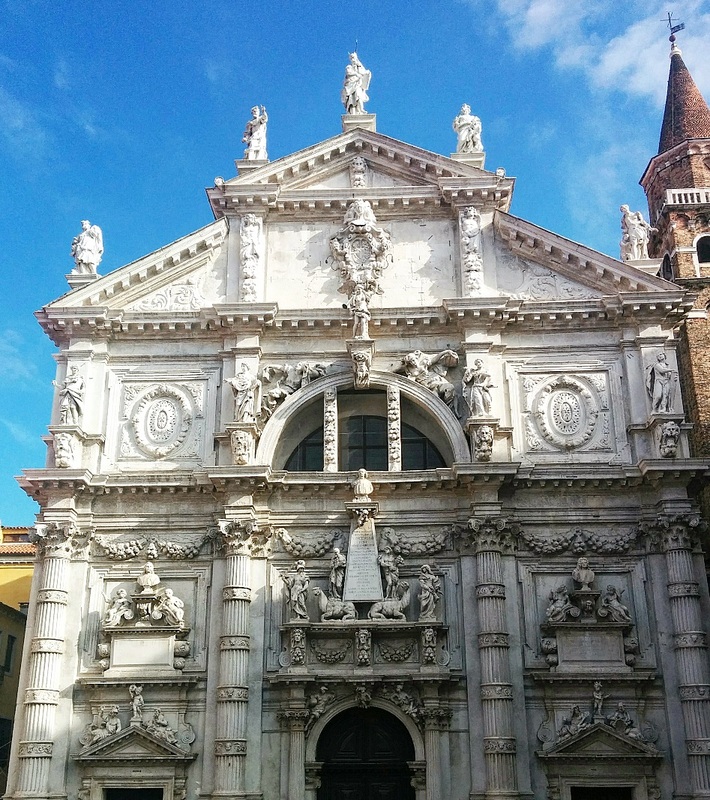 I’ve put together the itinerary we did via photos that showcases our ventures around Venice and surrounding islands to give you a great starting point to planning your own getaway in the hopefully near future. The weather was chilly with a mix of sun and rain during our weekend there, but it really didn’t bother us and I’d go back during the winter months again. It was also less crowded since Carnival just finished and even though there were lots of tourists around, you could still find yourself to be the only one on the street. So I’ll say that Venice is a destination you can visit all year round. Before leaving the airport once arriving, we went ahead and and purchased round-trip tickets to use for the waterbus to enter and leave the city, and it was a better deal than paying more for 2 separate one-way tickets. Besides the waterbus, you also have the option of taking a water taxi like the one in the picture, or if you want to be fancy you can hire a private boat to take you into Venice. This was our view while waiting to take the waterbus to the main stop at San Marco’s Square. No matter which option you choose, it will be such a fun, new experience to have. Can you imagine living in a place that uses boats as the only mode of transport? After getting off the waterbus we headed towards our hotel to check-in and plan our day. My love found a great package via verychic.com which included a free room upgrade (to junior suite), a private boat ride to Murano island and an exclusive tour of a Murano glass workshop and enormous gallery. About to hop off the waterbus and step into the wonderland that is Venice. The sun was shining and it was nothing but beautiful views all around. So much character and charm this city holds! And please, DO get lost within the canals and curving streets – you’ll always find your way back but it’s so much fun to turn left instead of right and see what you’ll discover. As the saying goes: “go off the beaten path”. This is what Venice looks like with every turn you take – crossing over a little bridge, looking at boats old and new docked next to their owner’s residence. Or you will walk by gondola’s taking a break with their owner’s on the side of the bridge. I liked saying hello to them to try out the little Italian I’ve picked up. You can find churches of all sizes throughout the city, each elaborately decorate with its own unique architectural style and I truly appreciated looking at each one we came across. This particular church was right by our hotel, so we got to stop and admire it every day. One entrance to our hotel: Duodo Palace. As the name suggests, it’s a renovated Palace from long ago and inside is very authentic, including a canal side entrance. We took our included boat ride to Murano Island using the canal side entrance by just taking a step from the hotel lobby and into the boat on the water. It was definitely a little piece of luxury! The view outside of our enormous junior suite upgrade. You could hear the bell tower ring at every hour, the last being at midnight I believe. I love seeing pieces of other people’s lives just by taking a look at what’s on their patio or balcony. After checking in, we headed back out to explore the grand Piazza San Marco and all its lustrous structure of shops, columns, pillars, like the eye-catching San Marco Basilica in the picture above. 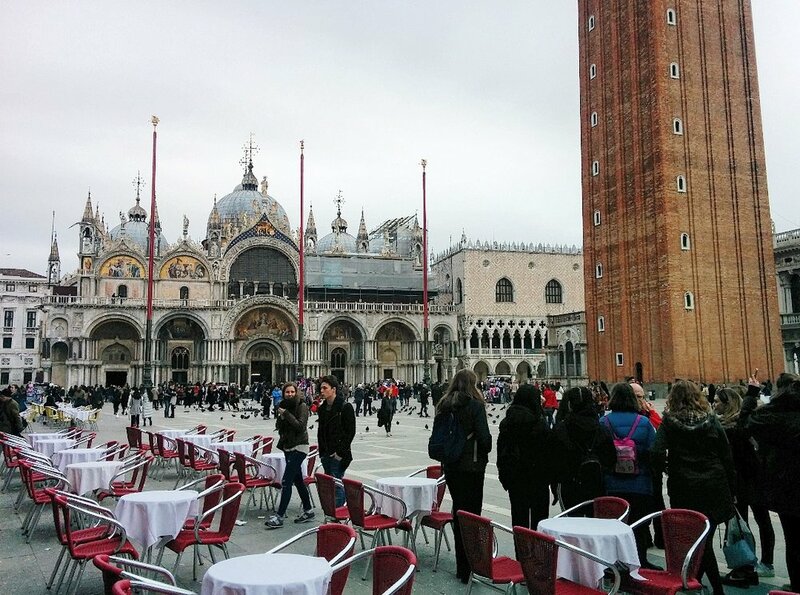 Piazza San Marco – Views of San Marco’s Basilica and the Bell Tower within the plaza. It is a must to go inside and take a tour of the basilica. Another view of Piazza San Marco – the boards you see were used during Carnival the week prior but people could still walk on them to get around in some areas, maybe to avoid wading around when the “acqua alta” – high waters – occur from heavy rainfall. We saw a little bit of this in a couple areas but nothing like in photos I’ve seen. Also, public executions used to take place in between the two columns in the distance and is bad luck if you walk in between them. I saw very few people walking in between the columns and I didn’t even try! As dusk begins to fall, we continue our walk, stopping at several vendors and tourist shops to see what they offer. I loved all the Venetian masks and tried to find another that would match one that my love already has, but I couldn’t make up my mind in the end. We’ll just have to take a new trip back so I can find the perfect one, perhaps we could return in the Spring? A classic view of gondolas bobbing up and down on the water with island views covered in churches and bell towers as a waterbus passes by. Watching this view along with listening to the sounds of the lagoon was pure bliss and relaxing. Our first take of Venice by night. It was so beautiful with the lights shining down on the blue lagoon. There is an essence of calm and security when you walk along the wide paths by the water. The city is very safe, even when walking back to your hotel past midnight. Words of Wisdom: Ask locals and hotel staff for restaurant recommendations. It’s the best way to enjoy the same dishes as the local residents and to avoid any disappoint or potential food poisoning – which happened to me when we decided to eat cheap one afternoon but chose the wrong place to go to. I felt so sick and so weak we couldn’t enjoy our last full day completely. Thankfully by the end of the afternoon I was feeling much better before heading to the airport. You live and you learn! 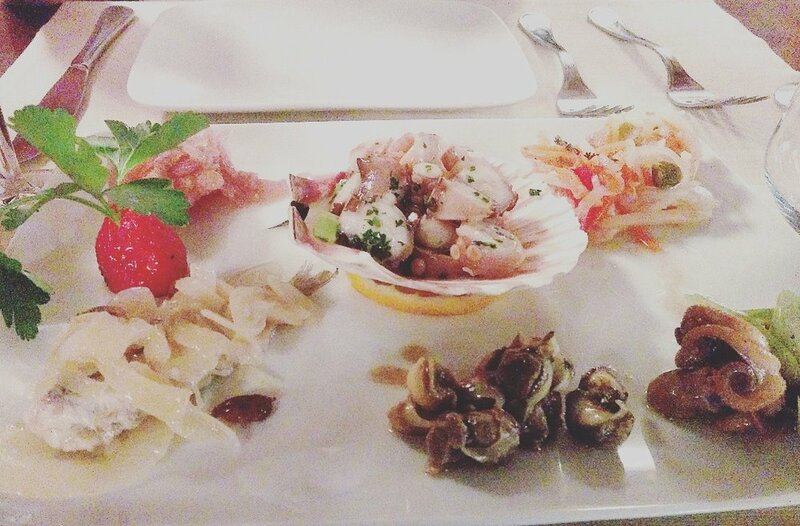 Our starter dish that we shared, full of fresh seafood with amazing flavor. Simply Yum! Some advice on the food in Venice: it's going to be expensive, but good. 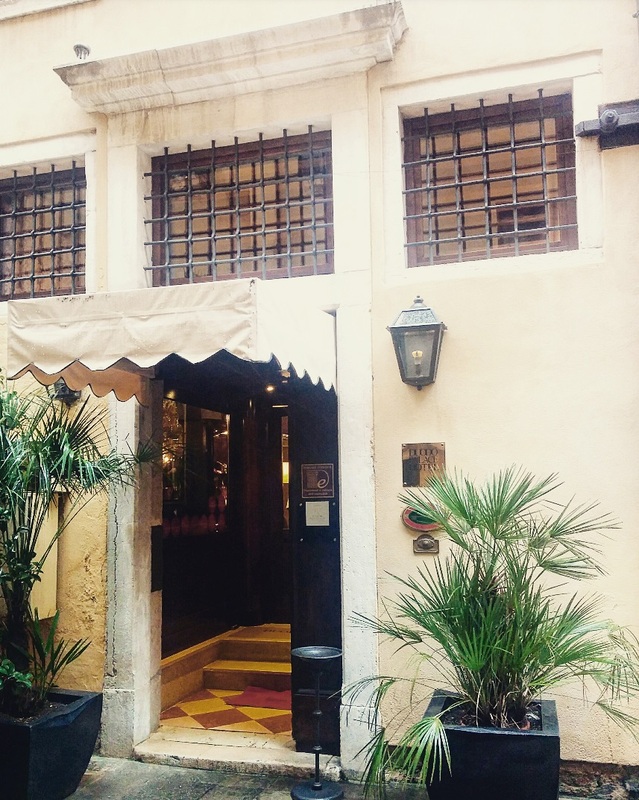 We asked for a recommendation from our hotel and they were able to make us a reservation at an amazing and authentic Venetian restaurant in the Rialto neighborhood. The next day on our private boat ride to Murano Island, famous for its glass-making craft. We had a tour of the workshop and the grand showroom filled from top to bottom with glass figurines, statues, and jewelry of all shapes, sizes and cost. Fun fact: Our guide mentioned that Leonardo DiCaprio had his Oscar award duplicated into a glass figurine from the workshop. I ended up buying a pair of glass turquoise earrings that were most likely overpriced since I purchased them directly from the workshop. You can find the exact same in one of dozens of tourist shops for much cheaper on the island or anywhere else, and for much cheaper. Once arriving after our private boat ride to Murano, we entered into the workshop of the well-known glass-making family business. As we watched a live demonstration of a small horse figurine being made, our tour guide explained the entire process to us step by step as the artist was creating his newest work. Afterwards, we were guided through numerous rooms that displayed all different types of glass art – all shapes, sizes, cost and aesthetic you can imagine. Earlier in the day we saw a flier for a mini opera concert at the hotel and decided to make a reservation and go after our island hopping. It was very nice and included a ballerina, harpist, and opera singer all dressed in classic attire and entertained tour group of about 20 people inside this lovely conservatory building about a 20-30 minute walk from Piazza San Marco. It was nice to visit another side of Venice that had more greenery and park areas. It was pleasant to have an evening walk before heading back to the hotel for a light dinner. 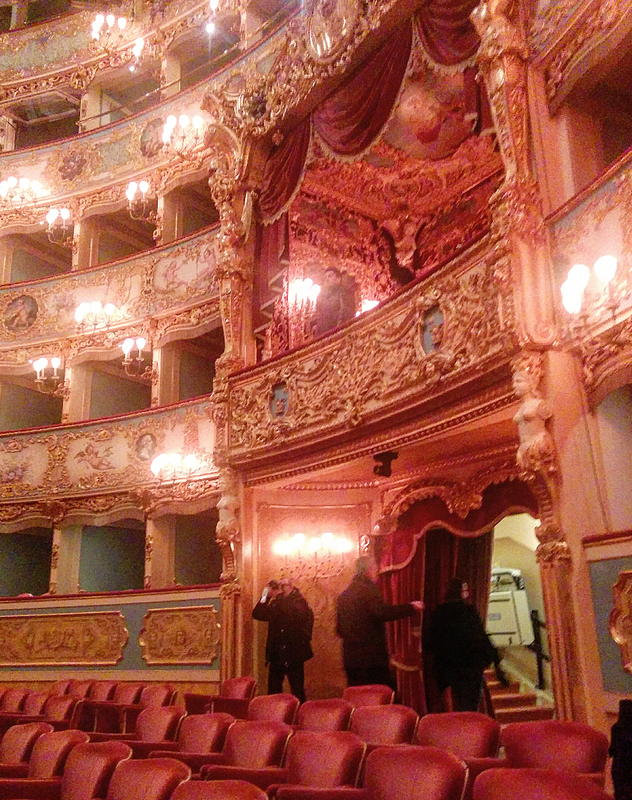 The only site we made it to on our last day was a visit to the Fenice Theater. As I was recovering from food poisoning I had to constantly sit down, so I decided to let my love go ahead and tour around the theater while I sat in the audience to take a few pictures. You can book to see an opera here, there are performances several times during the week. We had thought to go to one, but decided it wasn’t really in our budget. I highly recommend to tour through this beautiful structure which has caught fire and burned down at least twice before. Fenice Theater – view of the exclusive balcony seating area made for emperors and royalty. Well, we’ve started the second month of 2017 and just starting the Chinese New Year – the Year of the Rooster. How do you feel? Happy with a new, fresh start? Still holding on and tackling your New Year’s Resolutions? I’m happy to start February for many reasons, but the best are because it’s one month closer to Spring and because it’s one month closer to my next big travel adventure! As last year was finishing up and all throughout January, I took a step back to reflect on all the amazing, wonderful, fabulous, adventurous, even the not-so-swell moments of 2016. For many of us it was a complete roller coaster of a year, but we have to always remember the positive things that happened in our lives – the many bright and shiny, unforgettable moments, no matter how big or small, that brought smiles to our faces. This post is dedicated to these highlighted moments shared through photos, one from each month – good ‘ole 2016 – and I threw in one extra photo to give you a taste of what my 2017 is looking like thus far! January 2016: The picture I’ve chosen for January was actually taken Dec. 31st in New York City. My boyfriend and I had spent Christmas with my family and on our way back to France we purposely had a 12 hour layover so we could discover more of the city. At the beginning of our Christmas trip we stayed in New York for a long weekend and had my brother fly up to join us. Being my first time in the Big Apple, I wasn’t disappointed. NYC was just as I had always imagined, especially during the Christmas season. The picture below shows part of Times Square, blocked off in the early evening (although barriers were put up during the early afternoon that day). We were headed to the amazingly delicious Magnolia Bakery to get some treats to eat while waiting at the airport – the best idea ever! February: Upon arrival to the airport, exiting out and walking to the boat taxi port, I knew Venice was going to be an awesome trip. Any destination surrounded water always gives me a romantic vibe, and I think Venice wins the romantic marker in my book. In this picture you can see how water is associated with the daily lives of Venetians, with the Adriatic Sea flowing along, boats sailing in all directions to and from the many islands and through the canals. The architecture is so divine and really gives Venice it’s distinctive character. A perfect destination with your Valentine. 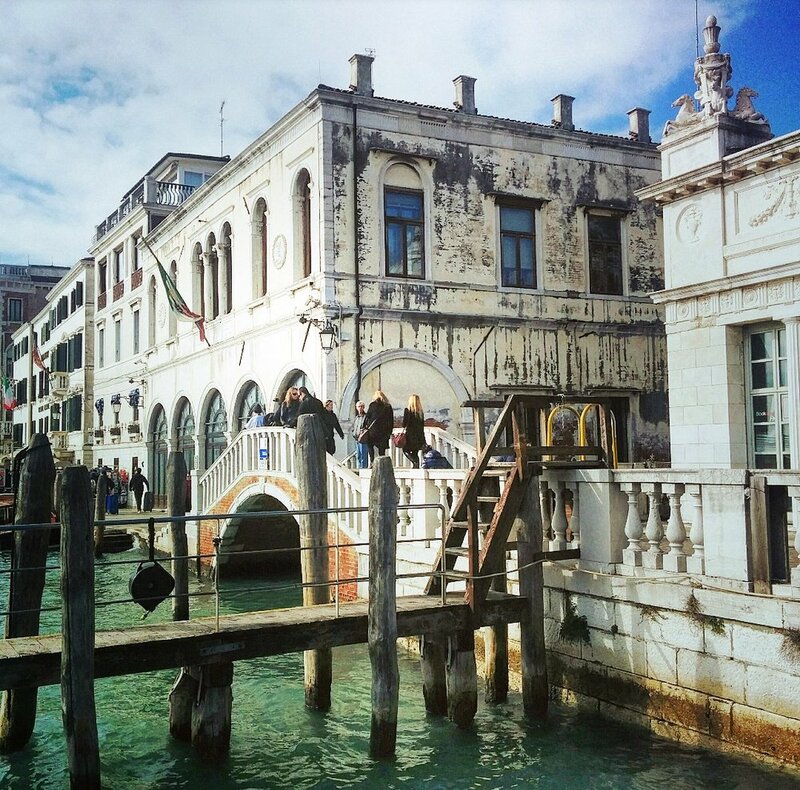 February 2016 – Venice, Italy – One of the most romantic places I’ve ever been to! March: A little weekend getaway to the town on Clisson, about an hour away from where we live, and discovered a bit more of the Loire Valley and its wine country. I got my boyfriend a wine tour and tasting package for his birthday back in January I had scheduled the day in March when the weather would be sunnier. The degustation included receiving 6 complimentary bottles from the winery’s cellar. In the picture is a view of the restaurant we ate dinner and also the river that runs through the town. We also took a walk through a nice park to end the weekend. April: Another month of appreciating the surroundings of where I live. This photo was taken in one of the neighborhoods by my apartment. Saint Nazaire was completely destroyed during WWII, however you can still get a glimpse of what the city was like before the war with the few buildings and houses that have been reconstructed and maintained back to their original structure. This photo shows a perfect example of French seaside architecture and just how chic it was to have lived in this city before. 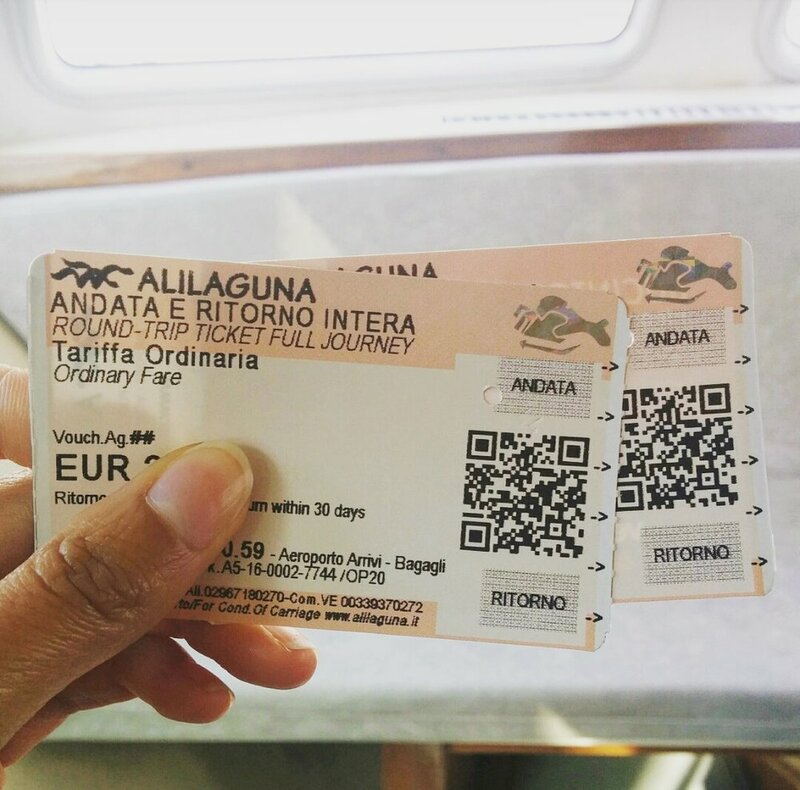 May: The month of May 2016 was filled with travels galore! At the beginning of the month we visited my family in Leicester and Derby, England. The weather was perfect during our stay and a great way to introduce my boyfriend to other parts of the country (as well as my family!). The first picture dedicated to this month was taken by Leicester’s town hall, the weekend just after Leicester City won the championship in their football league. The end of May was welcomed by my favorite couple and longtime friends from the states who were taking a trip around Europe. They started by visiting us in France, and where we took them around Paris and Nantes, then we all traveled to Amsterdam for the first time and explored this charming city. 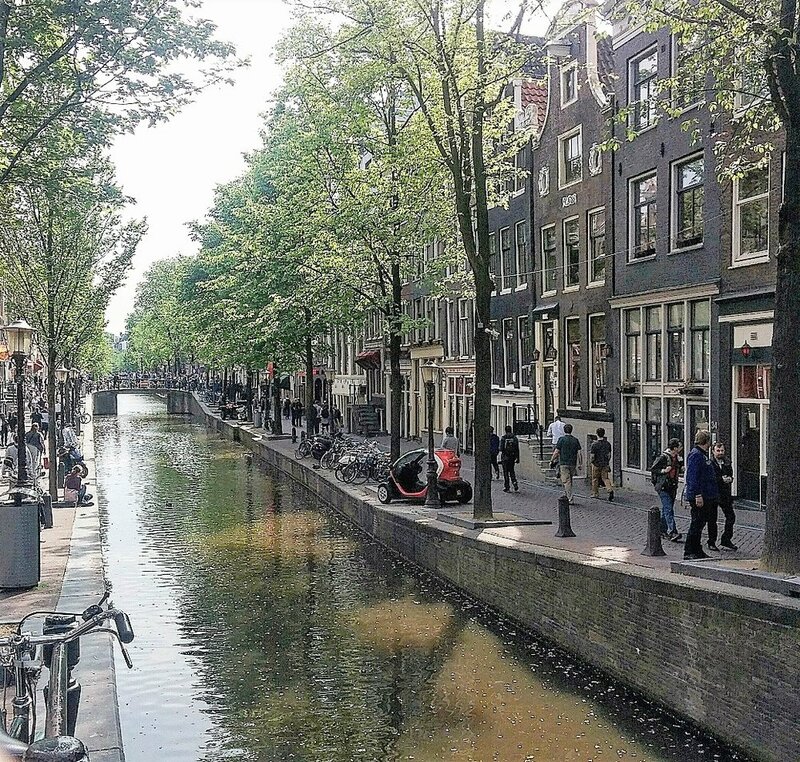 The second picture in this selection was taken by one of Amsterdam’s many canals, complete with boats, bikes, and an inspiring quote posted on a building. I would love to have the opportunity to explore more of the Netherlands again, maybe this time bring back some tulip bulbs? June: I love castles and chateaux, so what better way to spend the warm summer by exploring one with the largest garden I’ve ever seen? The chateau of Villandry is such a beautiful place to visit, inside and outside. We visited the domain while spending a long weekend with my boyfriend’s grandparents, who live in Tours and is only a 30 minute (and very scenic) drive away. We spent over 2 hours in the expansive garden alone! Since we arrived in the last group for the day, and after a free tour of the chateau itself, we felt as if we had our own private tour and had all the garden to ourselves. It was a very special day! July: Barcelona! My first time in Spain and I wish I could do it all over again. I loved this city and all it has to offer, from tapas to museums, to the beach and nightlife. I also loved having the opportunity to practice my Spanish with the locals. This picture was taken in the famous Parc Guell with Gaudi’s beautifully created mosaics gracing the seating area that curves all around an area of the park. We went earlier in the day to avoid the hot afternoon temperatures in order to have the most time to enjoy the park. August: My favorite time of the year last year. Also celebrating 2 years since moving to France! My mom, sister, and niece all came to visit for a week and we spent three of those days in Paris. On the first night there together, my boyfriend’s brother offered to take us on a midnight tour of the city, and it was perfect! I love this photo of my sister and I together because it shows how happy my sister is to be in Paris for the first time and for both of us to spend time together. Can’t wait to do it all over again this year, only this time it will be at home in Saint Nazaire. August 2016 – Paris, France – A midnight stroll through the center of the city. September: A much quieter month to rest and relax after the busy vacation period. But I did get the chance to try out a new sport on the beach called “Char a voile”, where you sit in a plastic buggy seat, your feet placed on a bar attached to the front wheels, and you use the wind and cords to steer yourself along the beach and around a sand track. I never thought I would get the hang of it, but was pleasantly surprised to learn very quickly and had a blast learning how to control the vehicle on land using nothing but the wind to propel you and the cords to guide you. October: Spent a weekend away and discovered the grand palace of Versailles! I was very intrigued by how many times the chateau has been transformed by its various owners since it was first constructed hundreds and hundreds of years ago. This picture shows one of the most popular rooms in the establishment: “La galerie des Glaces” which translates as “The Hall of Mirrors”. As you enter into the Hall you see mirrors to the left, placed exactly identical as the windows facing each one, giving the room a sense of grandeur with natural light reflecting all around the room, glimmering from the golden statues to the mirrors and the crystal chandeliers, complete with lit candles. November: A month of multiple celebrations with mini-trips to go along with them. November is my birthday month, and last year was a special one indeed because I turned the Big 3-0, celebrating it in style in Paris. I also discovered Dijon, the town not only known for its famous mustard, but also for its many well-preserved churches and, my personal favorite, its wine, as the city is located in the land of Burgundy. One of the prettiest cities I’ve visited in France, Dijon contains beautiful architecture that gives the city an ambiance of elegance, and a taste of its rich history. Dijon, France – November 2016 – View of one of the many churches that graces the city. December: I refer to it as the month of amazing sunsets. I had seen so many colorful sunsets formed in the winter sky and it brought me peace and reassured my mind that winter doesn’t last forever. The picture below was one taken just before going inside the Tour Solidor just as the sun was beginning to set in Saint Malo, France. We spent 10 days celebrating the holidays with my boyfriend’s family in Dinard, with Saint Malo being a short 15 minute drive away. I love how there seems to be movement in this photo from the water and boats floating at their anchored spots as shadows, plus the sky beginning to turn from blue to crimson. Saint Malo, France – December 2016 – total relaxation while gazing at the sea and sky as the sky becomes a bright mix of colors, from yellow to blue to crimson. January 2017: Ah! A fresh new start and beginning! I know this year will be a great one. I started the year out in style with yet another trip to Paris, this time to celebrate my boyfriend’s brother’s 25th birthday, which is a big deal in France, and also spending an afternoon at the Grand Palais to see an exhibition on Mexican art, showcasing two of my favorite artists: Diego Rivera and Frida Kahlo. I was blown away, standing in front of works of art that I had only seen in books and online, always dreaming to see them one day. Just a couple days ago, I discovered a part of history that was unknown to me in Saint Malo, France. I have ventured to this seaside town many times since moving to France almost two and a half years ago, but I had never seen the historical Tour Solidor, or the Solidor Tower. 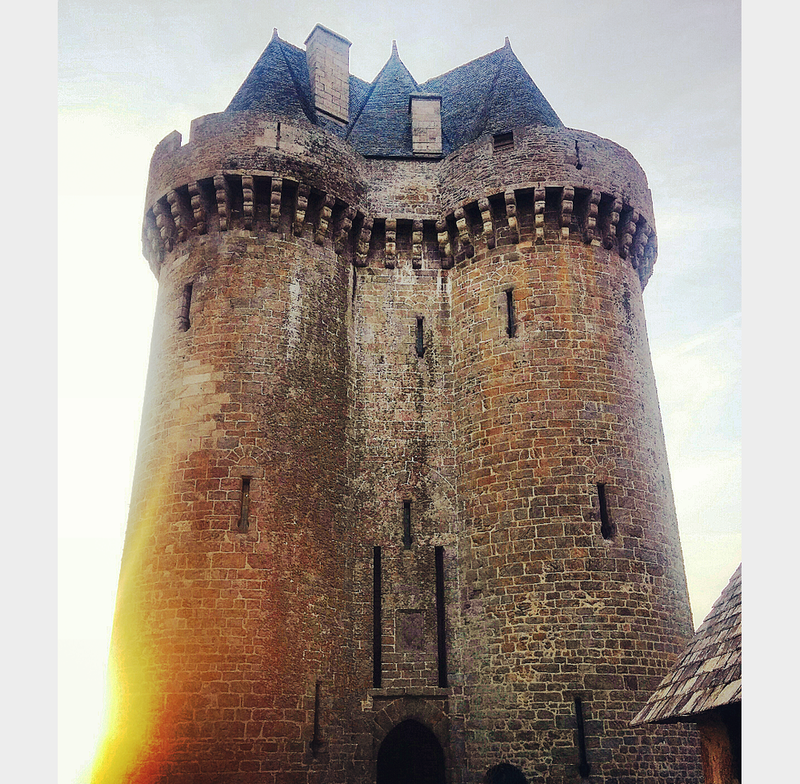 It has its own place separate from Saint Malo’s famous walls that surround the historical part of the town. I took these pictures just before entering and directly after the visit. I am always amazed at architecture dating back hundreds of years and how resilient they were made to be. Built in the 15th century, although a similar tower has been mentioned as far back as the 12 century, the tower has stood the test of time, including powerful sea storms, numerous wars, and centuries of wear and tear. Today, as you enter each room and climb up the stone spiraling stairs to the very top, you will find it houses a collection of nautical art and artifacts, model ships in different sizes, and various maps exhibiting the first expeditions in the 14th century from Europe to Cape Horn. A great example of being resilient! It was near sunset when I visited the museum and when I got to the top and exited to the outdoor area that spans around the tower, I was amazed at all the beautiful colors of the sunset that was being created in the sky. At this moment, as I was gazing at this magnificent view on top of this historical tower, I wondered to myself: how many people have been as in awe as I am throughout the centuries to see a sunset like this? So far, this winter has brought some amazing skies to please our eyes! Christmas is always a special time of the year, no matter where you are in the world. I have spent Christmas in all different kinds of ways, from spending it with friends and family in the U.S. and England, once by myself a few years back when I was a student, which was actually very relaxing and I still remember taking a nice, hot bubble bath complete with candles and wine, and now for the second time with my boyfriend and his family in Dinard, France. The small seaside town on Dinard is located on the northwest coast of France in the region of Brittany, about a two and a half hour drive north of where I live in Saint Nazaire. It’s a beautiful little town with a population around 10,000 in the off-season, full of character with its mix of British and French seaside architecture. During the big vacation periods the city can double or even triple in size. Many people from Paris and other big cities have a second home here and escape to the seaside for some R&R. I’m happy to have my boyfriend as a native of Dinard to take me around to his favorite places and hideouts, trying to avoid touristy areas as best as we can. If you love the ocean, you would enjoy walking along the stone made paths built into the steep rock edges that just right into the ocean, while taking in the distinct sea air and gazing at the emerald colored water and the majestic views it brings of the neighboring town of Saint Malo and also the small islands spotted here and there. We visit Dinard usually once a month, and every time we’re there I always can’t wait to get my refill of mystery and splendor the area brings. Before arriving, we spent the last week in Saint Nazaire Christmas shopping, packing, and walking around town looking at the Christmas decorations and getting into the Christmas spirit. The streets were covered in a thick blanket of fog for three days straight and it was hard to get motivated to get out of the house but we eventually got there and got the holiday spirit revived inside. The two major shopping areas in Saint Nazaire are the Ruben Bleu and Paquebot outdoor malls, filled with major and local brands. This year mini carousels and a train ride were set up for children, in addition to a petting zoo with small farm animals and a big mailbox exclusively for letters to Père Noël aka Santa Claus or Father Christmas. The streetlight poles are decorated with glimmering lights in a coordinating fashion – we have many more lights up this year than last, if I remember correctly. There’s also an ice-skating rink set up in the big plaza in front of the Mayor’s Office, on top of what usually is a big fountain. Finally, a big carnival for all ages is set up in another big plaza, where you can walk around in a funhouse, ride the main attraction that spins you upside down, buy barbe à papa, or cotton candy, chichis, or churros and a hot cup of vin chaud, aka spiced mulled wine. And don't worry, these are all located within walking distance from each other. The hustle and bustle of Christmas preparations are the same in France as in any other country celebrating this holiday season: putting up and decorating a real or fake tree, decorating the house – only in France the majority of people don’t decorate the outside of their house, only the inside – preparing for visitors or traveling around, stocking up on food for all the Christmas meals, making cookies, wrapping presents, the list continues. Christmas cookies just for me! A sweet gift from my German neighbor. To be honest, I was feeling like a Grinch until the last few days before leaving for Dinard, mainly because I was super bogged down at work with teaching and prepping Christmas-themed lessons, not to mention being in charge of the student Christmas party – no stress, no pressure, right? Well, after relaxing the weekend after the busy work week, my Christmas spirit finally made its appearance. As far as presents go, I tried to keep it to a minimum and gave more thoughtful gifts to everyone, continuing my “gift of giving” ambiance, as I mentioned in my last post about my Frenchie Thanksgiving. After opening the presents, I could see that everyone understood that I selected each present carefully and had each of them individually in mind when I selected them. What were their presents, exactly? Edited photos from certain moments during my boyfriend’s sister’s civil wedding in November. I was quite happy with the results, as were they. So what do the French do before, during, and after the Christmas holiday? Well, to welcome winter, change of food menu is in order. We switch to heavier foods that sometimes involves a lot of cheese, like fondues and raclettes – two of my favorite dishes because not only are they delicious, you typically enjoy these dishes in groups since there’s a lot to go around. My boyfriend also likes to eat braserade, or cooking meat on a small metal wood-burning grill they set on the table. To sum up, winter welcomes more meals together with friends at home or at a restaurant, with everyone sitting around the table enjoying good food, good wine, and good company for the evening. Just like other Latin-based cultures, the French spend many hours around the table talking and eating, and I love it. As the saying goes: Eat, Drink, and be Merry! Cheesey, gooey, delicious fondue at our favorite fondue restaurant in Pornichet, the next seaside town over. An assortment of French cheeses, fruit, nuts, and red wine - tis the season! Another popular activity to do with friends and family is to visit the Christmas markets that are set up at the end of November and continue until the New Year. In Nantes, the largest city near home in Saint Nazaire, has very nice markets this time of year and I’m eager to visit others around the country. Each stand looks like a gingerbread house in my eyes, each with a vendor selling his or her craft, from holiday treats like homemade nougat to handcrafted gifts to modern gadgets to unique and original things you can’t find anywhere else. Last year I found the cutest and quirkiest candles I had ever seen. There were shaped as different desserts, and I chose three cupcakes and an ice cream sundae for my boyfriend’s mom, which she loved. I never had the opportunity to tour the markets this year but I definitely won’t miss them again next year. To finish, Christmas was wonderful this year, and we celebrated with my boyfriends family on Christmas Eve, first by going to evening mass, then coming home and have the apero (finger foods and a drink) while opening presents, followed by a light dinner of oysters and fois gras with red wine, and ending with a chocolate ice cream bouche log for dessert. I wish you all a great rest of your Christmas week and that you’re all ready to celebrate the New Year and what amazing things 2017 will bring to everyone around the world. CREATE AMAZING COPY THAT INSPIRES CLIENTS TO EXPLORE THE WORLD.